Projects of Green Belts who successfully complete ProcessArc’s propriety training typically exceed $100,000. Lean Six Sigma Green Belts are functional-area experts who provide support as team members to Black Belts. While Green Belts start off in a support role, over time they will execute smaller-size, functional-area- specific projects. The delivered financial benefits of Green Belts who successfully complete ProcessArc’s propriety training typically exceed $100,000.Green Belts training focuses on Lean Six Sigma fundamentals, but has a larger focus on LEAN principles. As functional experts, Green Belts mainly focus on standardizing key processes, reducing service cycle time and improving general process efficiencies which require a more in-depth knowledge of LEAN tools. Our process takes the Green Belt project to results that impact the bottom line:The course is one week in duration. Prior to class our instructors work with Green Belt candidates to ensure that an appropriate project has been selected. Post training a comprehension test is provided to ensure that all gaps in knowledge have been resolved. The Green Belts are then expected to successfully complete their projects. Experience has demonstrated that in class training is not always enough. We understand that sometimes support and coaching is required after the training sessions. 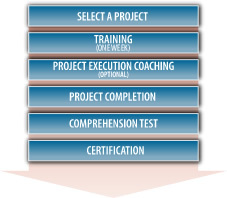 ProcessArc has designed options to support you throughout the process. Please see our Lean Six Sigma Coaching Module for more details. Green Belts generally have functional roles within the organization. They are experts in their area. While they may not be able to dedicate the majority of their time to project execution, they play a critical role in the success of a Black Belt project. Green Belts are business process improvement enthusiasts, and will support the deployment of Lean Six Sigma throughout their organizational area.